Relax and indulge on your vacation, Pay one Price. Kenya has become a popular destination for its variety of wildlife, cultural activities, and beautiful landscapes. Visitors can choose to go to larger cities, like Nairobi, but most choose to fly or drive into the beautiful safari and national parks that Kenya offers. One of the most famous of these parks is Ambolesi National Park. 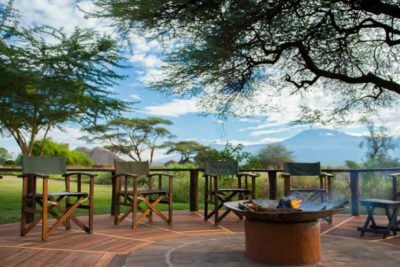 This is the perfect environment for a wildlife safari viewing and awesome Amboseli National Park Lodges some with spectacular views of the great Mt. Kilimanjaro. Amboseli National Park offers visitors a variety of activities and experiences: views of Mount Kilimanjaro, the chance to get up close with wildlife (especially large packs of freely roaming elephants), meet the indigenous Maasai people and learn about their culture, and discover some of Africa’s most beautiful and untouched safari. The park lies south of Nairobi and encompasses an ecosystem that spans over large parts of Kenya and Tanzania. Most game lovers and tour guides have ranked this as one of the best places in Africa to view wildlife. One of the best sights to behold is when the hundreds of elephants are trekking on the plains of Kilimanjaro. There are other animals in the park, including giraffes, zebras, gazelles and all the big cats as well as other smaller animals. Most clients visiting Amboseli National Park combine the visit with either Tsavo National Park or the world famous Masai Mara National Reserve. Amboseli National Park is 240 kilometers from Nairobi, which is the capital of Kenya. It is at the border of Tanzania, in the northwest part of Mt. Kilimanjaro. The park can be accessed either by driving from Nairobi or flying into the one small airport in the park. Visitors can drive through the park themselves, following designated roads, or join a tour group. Amboseli is most famously known for its elephants, which walk freely in large herds around the park and can be approached and seen more closely than in most other national parks or safaris. Aside from elephants, visitors can also come across buffaloes, crocodiles, impala, lions, cheetahs, hyenas, giraffes, zebras, and wildebeest, to name a few. Because of some of the large swamps and lakes within the park, visitors can also see many different birds, amphibians, and other wetland animals. The landscape – which is relatively dry and sparse most of the year – makes it easier to see all of these animals from long distances than it may be in other regions or parks. When on safari to view animals, the park requires that visitors stay in their vehicles in most areas, which protects the wildlife and encourages natural growth of these animal communities. Kenya and the native people’s dedication to protecting the park has allowed animals to flourish within it. These Amboseli National Park Lodges offer full-service bathrooms, on-site restaurants, wifi, pools, and other amenities. 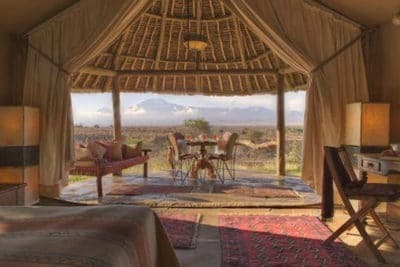 Some of these luxury hotels in Amboseli have everything you might find in a hotel in the city, but with the views and solace of a camping safari experience. Depending on the Amboseli National Park Lodges you choose, these rooms will either be part of a large lodge with many rooms (much like a traditional hotel) or separate luxury cabins. 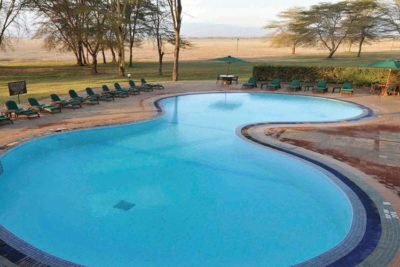 Amboseli National Park Lodges and hotels are fully accessible, offering visitors with special requirements to easily enjoy all the park has to offer. Many of these Amboseli National Park Lodges also offer full packages, so you can fly-in and the game drives can be organized from the lodge. This will help you cut down on time spent on the road. Amboseli National Park is an all year destination. A few days in the Month of April and May can be a bit wet but that does not take the shine from Amboseli. The best wildlife viewing months in Amboseli National Park Kenya are during the Dry season from late June to December and from January to Early April. Most of the safari animals in Amboseli National Park are resident animals. The elephants however tend to move a lot between Amboseli National Park and Tsavo National Park. There are countless experiences and sceneries to behold in Amboseli. As THD, we rank this as one of the finest tourist destinations, for anyone who is interested in a real adventure. There is a park that is at the hills of Mt. Kilimanjaro, which provides unmatched beauty. You will definitely have alluring photos, which can be taken at this scene. When there is some morning light, you will be able to see washed coral and snowy massif, which plays a huge complimentary role during sunrise and sunset. 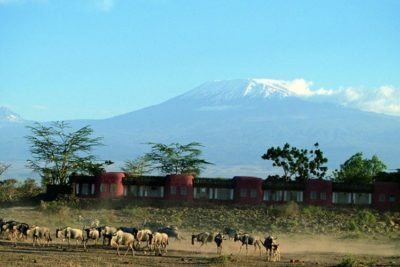 Amboseli is a Maasai word, which means, ‘place of dust’. The major attraction is the herd of elephants that are found at the foothills of Mount Kilimanjaro. The rainy season attracts a wide abundance of wildlife, which comes to feed on the cornucopia of life in the region. There are several habitats, which are occupied by wildlife in this park with the main ones being thorn scrubs, marshlands, acacia woodlands, open plains and swamps. With all these different habitats, there is a wide diversity of game to view all year through. The dry seasons, however, make the park look unattractive, but there are still animals that can be viewed. You should ensure that you visit the centre of the park, which is at Ol Tukai. The Observation Hill is also a major attraction, which gives you a clear view of the entire park and you can take some amazing photos from the top of the hill. You will also see the Maasai people carrying spears and wearing the bright ‘shukas,’ which are red in color. There are times when the hot air balloon tours are available in the park.